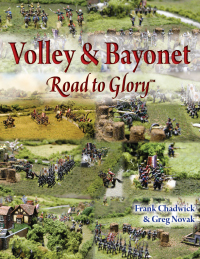 Last night it was great to deploy our 6mm miniatures for a most enjoyable Volley & Bayonet encounter. 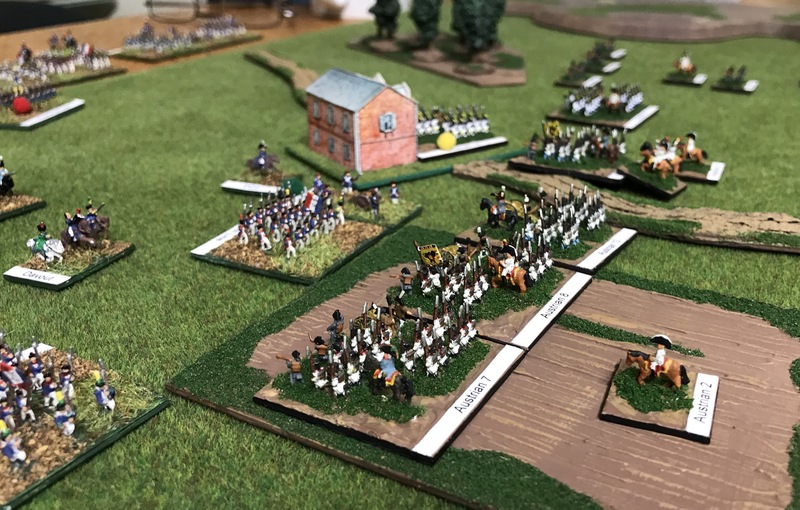 This time an 1813 engagement using my Austrians and Jon’s French. As is almost always the case we use the Road to Glory scenario system to develop the situation. The gaming room was full, with both the French and Austrians commanded by three players each, including two out of town visitors. As it happened the Austrians, commanded by Prinz Schwarzenburg, had the burden of attack. Under his command he had two Korps but only four divisions concentrated. Additional divisions were advancing and would swell the Austrians to six divisions, but the arrival and deployment of these divisions would take time. The French meanwhile were isolated with only two divisions initially deployed. However, their initial reinforcements would arrive earlier, potentially swelling the French to parity. 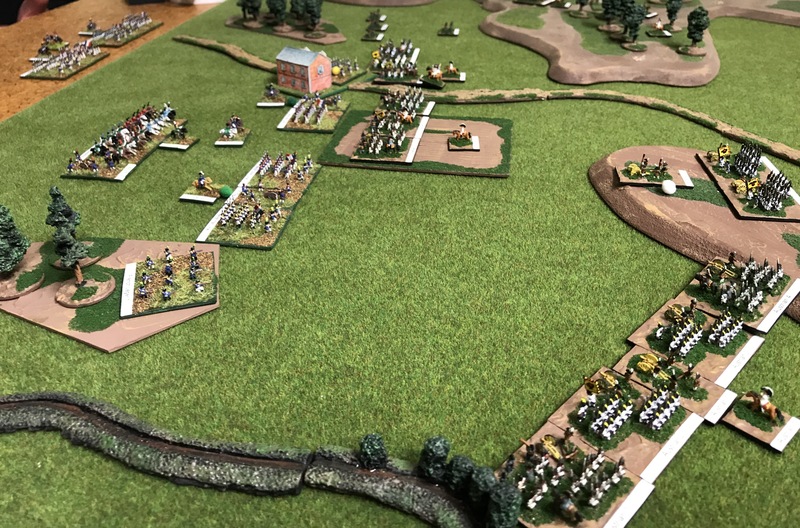 Schwarzenburg attack, if it was to be successful needed to inflict casualties before the French could concentrate, and disrupt the deployment of these French reinforcements. The initial Austrian attacks were delivered with great determination, starting around 3pm. The town of Freilberg, forming the initial French left, was taken quickly by two Austrian infantry regiments from Murray’s 2nd Division, themselves from III Armeekorps. However, a swift French counterattack dislodged the Austrians. Undeterred, the Austrians attacked again, though this time the attack failed and Freilberg was now firmly in French hands. Extending the French positions to the right of Freilberg were several regiments. Simultaneously with the attacks on Freilberg Austrian forces also advanced here. Initial attacks involved elements of Greth’s Division, but soon Wimpfen’s Division, also from Colloredo’s I Armeekorps, supported by artillery, pressed the French. Here to the battle hung in the balance for several hours and involved charge and counter charge. Above, Austrian units advanced through tall crops to engage the French. The town of Freilberg is visible in the distance. Below, the more general situation. Initial French reinforcements were thrown in to stabilise the position around Freilberg with the result that the battle now extended both sides of the town. The Austrian right mostly comprised the Austrian Light Division from III Armeekorps, but was bolstered by regiments from the 2nd Division. As the Austrian forces slowly lost momentum the Gyulai, commander of III Armeekorp, hoped to regain the initiative by the deployment of his’ 3rd Division. However, it had taken almost 5 hours for the major elements of this division, commanded by Hessen-Homburg, to advance by road to the area of battle and shake out of road column. During this time the French had stabilised the situation and were beginning to move to the offensive. Above, the general situation around 7pm. Hessen-Homburg’s 3rd Division is starting to deploy in the Austrian centre but some regiments are still in road column. Hardegg’s Light Division is on the far right centre. 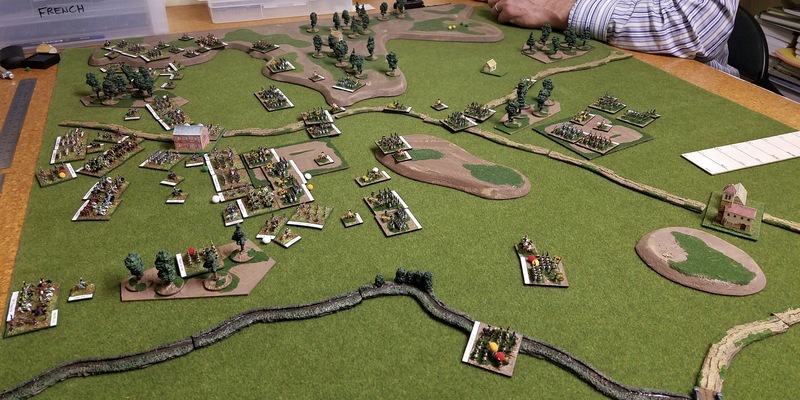 In the foreground two Austrian regiments, who have previously routed, are visible. On a number of occasions Austrian regiments lost melees on morale ties as the grenadiers of these regiments had been removed for use in converged regiments.